I’m from Azerbaijan and the region I grew up in is made of different cultures, languages, religions and customs within a very small area. I thought that analyzing the availability of alcohol in each country would give us an insightful look at how the social culture of each is transforming. The countries that were examined all share a border with Azerbaijan, they are: Russia, Turkey, Iran, Georgia and Armenia. The only available data on FAOSTAT was from 2000-2009. The results on which country has the most available alcohol for consumption per person is not surprising, Russia tops off the chart with 98.60 kg of alcohol available per capita. 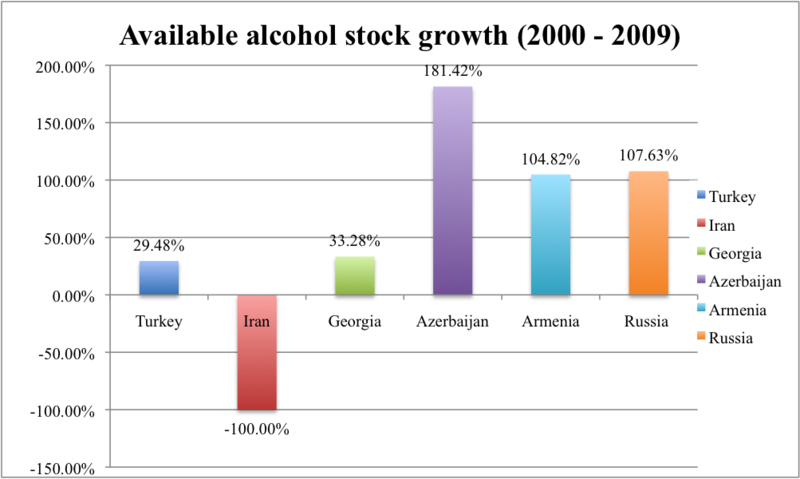 The most surprising finding was that amongst all the countries, Azerbaijan had displayed the quickest growth in alcohol availability per person. Its alcohol stock availability grew by an incredible 181.42% per person. Such a sharp increase in available alcohol stock for a country so small is pretty interesting and the reasons behind this push are varied. The best explanation is the social change that’s sweeping the country. Today, women of Azerbaijan can enjoy more social freedoms and it is no longer surprising to find a group of them at bars during a girls enjoying a few drinks. This new behavior of women is probably the main driver behind the increase. However, this is just an opinion and a more thorough look is required. 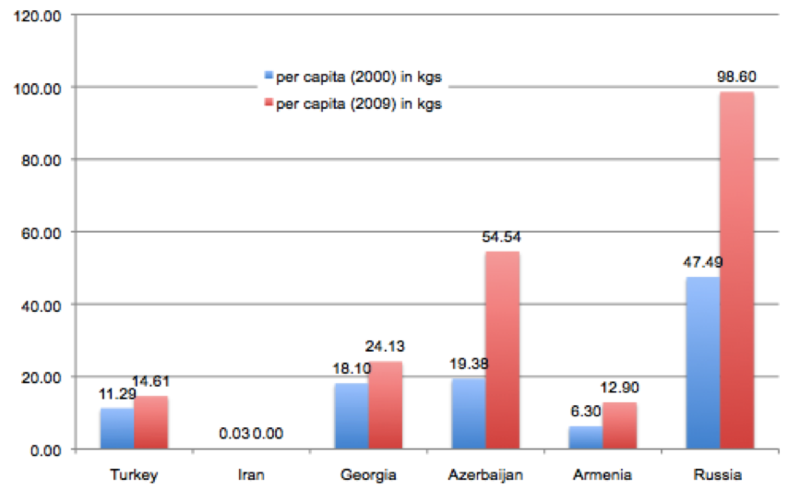 Other reasons for this growth could be the ongoing Nagorno-Karabakh conflict between Armenia and Azerbaijan or a possible decline in number of orthodox Muslims. The availability of stock was calculated with the following equation: Production – Export + Import. My goal was to look into the consumption level, however the FAO stats website didn’t have such data. To find the actual consumption level of alcohol we would need data on how much is bought, wasted or actually consumed (FAOSTAT does not have these numbers). Thus, we could only find the general volume of alcohol being produced, leaving and being imported to the country. Nonetheless, since it is not likely that much of the alcohol is being saved for a later time, we can safely say that there is a high correlation between the available stock and consumption of alcohol within a given country. Still, the high increase in alcohol availability in Azerbaijan is definitely worth a further investigation and we hope our readers familiar with the culture and region could share their theories with us. Posted on July 1, 2013 by saynotofoodwastePosted in NewsTagged alcohol, Azerbaijan, FAOstat. Previous Previous post: A vicious circle – Addictive food.